Synopsis: Abigail dreads swimming lessons. Every time she dives into the pool, she makes a big splash, and all the girls in her class shout: “Abigail’s a whale!” Abigail can see that she is larger than the other girls. She feels huge, heavy, and out of place. Review: When I first read the description for this book, I was like, WOW! Great! A book about bullies and fat shaming as it applies to kids. This is awesome! But I was rapidly let down. Bullying is a serious problem, and speaking as someone who was constantly bullied it can have serious lasting effects. 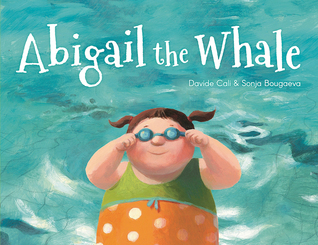 Although it's wonderful that Abigail was able to boost her own confidence, the book never addresses the root problem - the bullies in her swim class. The ignoring of the bullies by the instructor, an adult who should have stepped in, is the same as saying their behavior is socially acceptable and that it's up to Abigail to deal with them by ignoring them and becoming more confident. Well written, but a serious missed opportunity that prevents me from giving this a higher rating.